Collector items - If you can't find it here, please send email. I can probably get it. You can still pay me with defunct German Marks! DRG class V120-001 with pressured air transmission - looks like a steam engine, but the diesel motor generated the air that entered the cylinders that power the wheels. Wheel configuration 4-6-4. DRG class V188 diesel-electric double unit with two motors. Each unit has the wheel configuration 0-8-0. Engine not separable into single units. 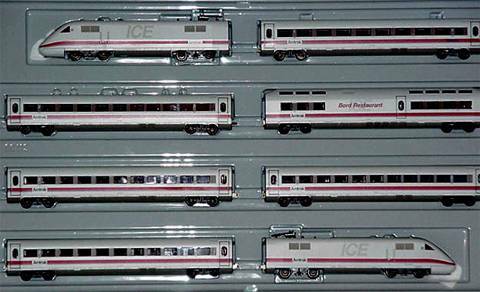 This could have become the Amtrak "Acela"
DB class 401 ICE 8-unit super-high-speed train in Amtrak livery as used during experimental runs between Washington, DC and New York. Limited edition. Only 5000 made. With certificate. 84564 Set USA Commemorative Edition 1492-1992. 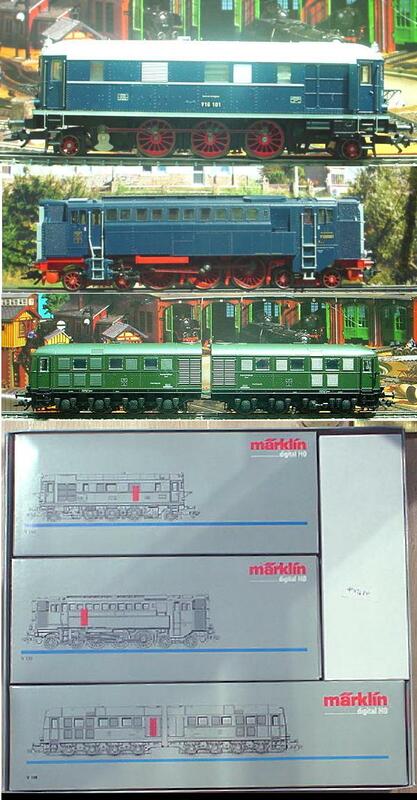 Exclusive edition for the "Idee und Spiel" chain of Marklin dealers made only in 1992. Celebrating 500 Years of America. The sides of each car are made of tin and are finely printed with spectacular scenes from the United States. Each side contains a different scene. The roofs are also made of tin, with brown plastic running boards. The front and back ends of the cars are made of plastic and colored in the national colors of the USA: Red, white, and blue. Operable sliding doors on both sides. Cars can be equipped with wheel sets for 2-rail operation. Price upon request. Collector items - If you didn't find it here, please send email. I can probably get it. This fat heavy red wine Qi bangs, big curly hair extensions uk hair. But also many of today's trendy hairstyle style, with simple costumes, it is easy to human hair extensions create street style. Brown is a brighter hair clip in hair extensions color that is also easily identifiable in the crowd, so if you like the hair color but not sure, the hair extensions online ladies can try this golden brown long wig.